The Michigan basketball team has exorcised plenty of demons this season. If the 13th-ranked Wolverines can cross one more notch off their bugaboo list on Thursday, they'll be one step closer to earning a share of a Big Ten championship. Michigan will look to snap a 13-game losing streak inside Illinois' Assembly Hall (7 p.m., ESPN), keeping its hopes of ending a 26-year league title drought alive. The last time the Wolverines won in Champaign, Ill., was 1995, when Fab Fiver Ray Jackson posted a double-double to lead Michigan to a 10-point victory. Time is running out for Tim Hardaway Jr. to find his game. 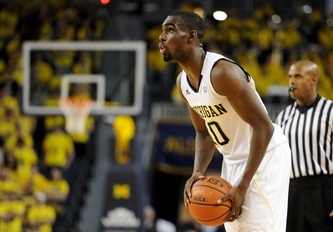 Tim Hardaway Jr. broke out of his Big Ten slump two weeks ago by starting to defer more. Rather than force an outside shot, Hardaway would put the ball on the floor and head to the basket, or simply look for another teammate within the flow of the offense. The strategy worked in home wins against Illinois and Ohio State. Hardaway didn't get carried away, playing more of a complimentary role to Trey Burke, only taking a shot if he was open. Against Northwestern and Purdue, Hardaway started to slide back into old habits, going 2-for-15 from 3-point range in both games -- struggling to score consistently in general. Michigan has two games left before postseason play begins, and if the team's biggest difference maker is going to figure things out, it has to be now. Hardaway has to start stringing together positive performances. He can't afford steps in the wrong direction at this point. And Michigan can't either. Burke has arguably been Michigan's best player this season, but in order for the Wolverines to have a successful postseason, that baton needs to be passed over to Hardaway. He's the only player on Michigan's roster that can create his own shot against virtually any type of defender. When he's at his best, he's a threat in the post, off the dribble, in the mid-range and outside. When he's slumping, he's none of that. Hardaway has to find his game, and he has to do it quickly, because he's running out of chances. 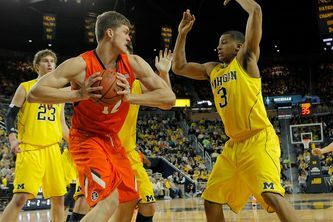 Illinois' Meyers Leonard protects a rebounds in a loss to Michigan at the Crisler Center earlier this season. Michigan dodged a serious bullet during its previous meeting with Illinois when Meyers Leonard got saddled with two fouls early in the first half. Leonard's early bout with foul trouble came just minutes after Jordan Morgan went to the bench with two fouls of his own, meaning Michigan didn't have to figure out how it was going to deal with one of the Big Ten's toughest big men without its only true center. Now there's a chance Leonard ends up in foul trouble again Thursday, but it's not exactly a safe bet -- especially if he comes off the bench again, like he did Sunday against Iowa. Morgan will likely have his hands full once again, and Michigan will need him to be at his best -- meaning no silly fouls on the first possession, and no frustration fouls after a missed layup or failed block out. The Wolverines' sophomore had perhaps the best showing of his career two weeks ago when he put up a double-double against Ohio State's Jared Sullinger, proving he can be a realistic option for Michigan in the paint when need be. When he feels like it, Leonard is as good as anyone down low in the league. And Morgan, in turn, has to be at his best if Michigan wants a shot. Michigan got caught guessing and grabbing plenty of times earlier this season in a matchup with Illinois. At one point during the second half, Michigan had been called for seven fouls to zero for Illinois, and the game was played in the Crisler Center. Afterward, Beilein said the Wolverines deserved to be in that spot, mostly because their perimeter defenders were out of position far too much. Illinois has talented guards in Brandon Paul and D.J. Richardson, two players that can get to the basket and really make it difficult for defenders if the overall defensive scheme isn't sound. Against Purdue on Saturday, Michigan again struggled to keep position, but rather than get caught fouling a ton, the Wolverines just let Terone Johnson slash to the basket all night long. Michigan obviously has to avoid foul trouble on the road, but more importantly, it can't get caught chasing guys like Paul and Richardson. That only opens the lane for Leonard, and allows the Illini to work inside. The Illini are the second-worst 3-point shooting team in the conference. So, stay in position, keep them outside and out of the lane. For Illinois, another loss would likely be the official knockout with regard to the NCAA Tournament. For Michigan, one more defeat officially blows any remaining shot the Wolverines have at a share of the Big Ten title. The Wolverines have talked about winning a league crown all year; quietly at first, and more defiantly down the stretch. Everyone knows the numbers, and 26 years without a league championship -- at Michigan -- is borderline ridiculous. The Wolverines have been given a second chance to get back in this thing, and if they blow it again, it might be something this current group never forgives itself for. Moreover, a loss to Illinois would do no favors to Michigan's resume at this point. The Illini are not currently a top-50 RPI team. So, the Wolverines don't need to pretend like their backs are against the wall Thursday. Thu, Mar 1, 2012 : 8:18 p.m.